If you’re trying to lose weight then you should be at least glancing at the nutrition labels on the side of food packets when you go shopping to help you make healthier, more nutritious food choices but it’s not always easy to get the information you want from them. You’d think being able to see the number of calories, carbs, sodium etc. would help you eat better but there’s often a bit of manufacturing trickery going on that you should be aware of. The absolute most important part of the Nutrition Facts table is to note the serving size. Here’s where manufacturers get a bit tricky. They often strategically choose the serving size to make the rest of the table look good. Small serving = small calories/fat/carbs. Sneaky huh? 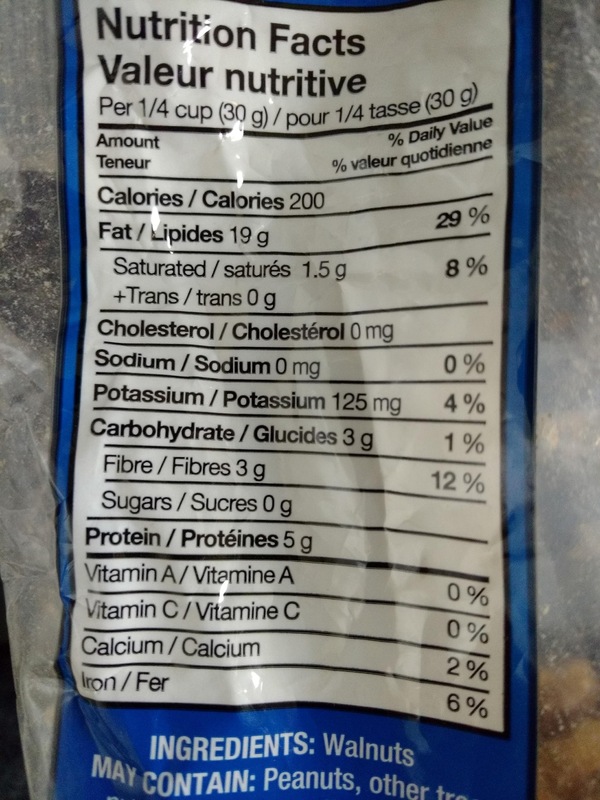 All the information in the label rests on the amount chosen as the serving size. And, since every manufacturer chooses their own, it’s also often difficult to compare two products. In the next few years there are plans to try and bring a bit more consistency in serving sizes between similar foods and also to make them more realistic about what someone might actually sit down to eat. This should make it easier to compare between similar foods. Here’s an example – plain, unsalted walnuts from Costco. Stop reading now and go see how big ¼ cup is. Not very big is it? Most of us would generally eat more walnuts than that in one sitting. Just watch those serving sizes if weight loss is your goal. The % Daily Value (%DV) is based on the recommended daily amount of each nutrient the average adult needs. Ideally but unlikely, you’ll get 100% DV for each nutrient every day. This is added up based on all of the foods and drinks you have throughout the day. You don’t need to add your entire %DV up for everything you eat all day. Instead, think of anything 5% or less to be a little; and, anything 15% or more to be a lot. NOTE: Not every nutrient has a %DV. You can see it’s missing for things like cholesterol, sugar, and protein. This is because there isn’t an agreed “official” %DV for that nutrient although some new labels will include a %DV for sugar. Keep your eyes out for that. The vitamins and minerals listed at the bottom of the table are also straightforward. 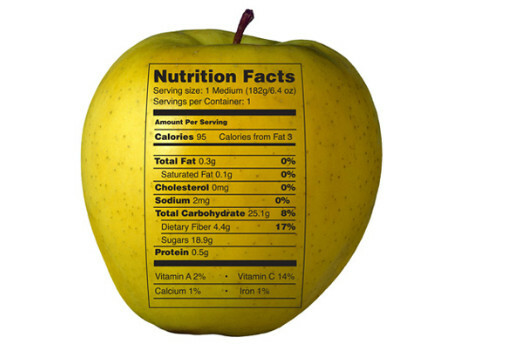 New labels tend to also list potassium, calcium, and iron. Yes, potassium will drop from the middle of the table to the bottom, and both vitamins A & C will become optional. Manufacturers can add other vitamins and minerals to the bottom of their Nutrition labels if they wish. You’ll notice that some foods contain a lot more vitamins and minerals than others do. Hopefully this will be helpful information for you when you next go shopping. The best way to lose weight is to eat foods that don’t have nutrition labels on them and come in unprocessed forms but if you are buying foods that come in bags and packets the keeping an eye on the labels and serving sizes will help you manage your intake and get a balanced diet.